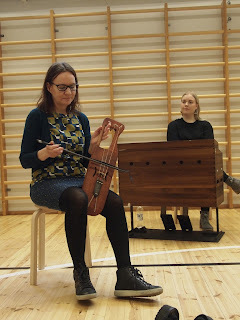 Today we had our first whole class (33 students) rehearsal for the forthcoming Eläinlaulut- concert. We practised some basics for a good, healthy voice control (posture, how to release tension etc.) and went through the practicals of the concert. We will have some collective rehearsals with the string orchestra and choir before the concert too! It is going to be a very nice experience for the children. Today's two latter classes we used for the reflection of the last weeks instrument- building workshop. All the children were still really excited of the workshop and keen on meeting our next visitor whom will be teaching us the basics of the long flute. Today we improvised with the flutes and got familiar with the overtone-scale produced by the flute (yläsävelääni-asteikko).